Back in 2006 I first met Nicola Gordon Bowe at the first conference of the ‘Imaging the Bible in Wales’ project in Lampeter, when she gave a distinguished lecture on the Irish artist Wilhelmina Geddes. This was at a time when I had only recently begun to look seriously at stained glass, as part of my work on the project recording biblical art in Wales. Apart from the window that Geddes made for the Church of St Peter, Lampeter, I knew nothing of her work. Nicola’s lecture left none of us in any doubt that Geddes was a consummate artist, who, like many others who have worked in glass, had been neglected in the prevailing fashion for painters and sculptors and the usual canon of movements in western art. This is underlined in Nicola’s masterly new book on the artist. 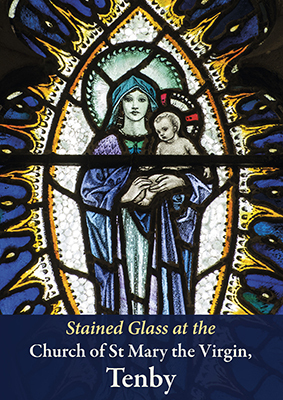 Rightly known as the expert on that other Irish luminary of stained glass, Harry Clarke, her book presents a detailed survey of Geddes’ career with many illustrations of her work and archival photographs. While her windows and preparatory drawings are most prominent, work in other media demonstrate the extraordinary ability of the artist. Wilhelmina Geddes is presented as an artist whose medievalism is not outweighed by her modernism, and who found modernism in the stained glass figures at Chartres of the eleventh and twelfth century. Her windows are often monumental, while attentive to detail, and unusual in their composition, as the detail on the cover demonstrates. The importance of her window at Lampeter was recognised by my colleague on the ‘Imaging the Bible in Wales’ project, John Morgan-Guy, whose suggestion to invite Nicola Gordon Bowe to our conference was inspired. The window was the most significant of her late works, and the commission is given plenty of attention in chapters ten and eleven, with numerous illustrations. Wilhelmina Geddes: Life and Work, by Nicola Gordon Bowe, is published by Four Courts Press. It’s not often that new source material for the study of artists in Wales is published. After many years of preparation, this spring sees the launch of A Dictionary of Artists in Wales, prepared by Peter W. Jones and Isobel Hitchman. There are (mostly) short entries on hundreds of artists who have worked in Wales since 1945 (the end date for information is 2007), and this includes a number of artists who have worked in stained and architectural glass. Many of them are also represented in Stained Glass from Welsh Churches, but some who trained and worked in Wales are not, finding commissions outside of Wales or for public places other than places of worship. Inevitably there are a couple of notable omissions. In particular I was sorry to find no inclusion of Colwyn Morris, who worked as a cartoonist at Powell’s of Whitefriars in the 1950s and 60s before designing numerous windows made at Tim Lewis’ studio from the 1980s until his death in 2011. Similarly John Edwards, who also taught on the stained glass course in Swansea, is not included. His powerful work for Celtic Studios in the late 1950s and 1960s is something that I tried to highlight in the book, and, like Colwyn Morris, he has made many more recent works with Tim Lewis. Also missing is Marjorie Walters, briefly married to the painter Evan Walters, who also worked at Powell’s and then returned to Swansea as Howard Martin’s first assistant on the stained glass course at Swansea College of Art. From my conversations with students who were on the course in the 1970s I found that she was remembered very fondly, but firm details about her were difficult to establish, and I was grateful to Marilyn Griffiths and Kirstine Dunthorne for their help. It is thought that she designed as well as cartooned the transept window at the Church of St Mary, Swansea (the east window at the church, also by Powells, was cartooned by Colwyn Morris), but no one that I spoke to could point to any actual evidence for this. It may of course have been the case that the work of interpreting a design by E. Liddall Armitage as a cartoon might have almost amounted to the design of the window. I have written a short article on war memorial and military windows which has recently been published in Cambria Magazine (vol. 14, no. 2, pp. 26–9). The article provided an opportunity to join up windows from the fifteenth century up until 1990, thereby providing a broader context for the chapter on First World War memorials in Stained Glass from Welsh Churches. It was also an opportunity to reproduce a couple of fine windows at a decent size, namely the William Aikman window in Llanbedrog, and one of the Heaton, Butler and Bayne windows at Flimston in Pembrokeshire. There is also a full page illustration in the book of the window commemorating the tercentenary of the founding of the Royal Welsh Fusiliers, designed by J.A. Nuttgens for the Church of St Giles, Wrexham. There are several illustrations in the book from this church, and there wasn’t room for this one in chapter 11, making J.A. Nuttgens one of the more significant omissions form the book. He also made a window not far away at Buckley, a depiction of the Good Samaritan. This is to be the last printed issue of Cambria Magazine, which was first published in 1997. The First World War memorial window by Karl Parsons at the Church of St Mary, Tenby, made a memorable impression on me when I saw it in 2006, not long after I began to record biblical stained glass in Wales as part of the ‘Imaging the Bible in Wales’ research project. Its inventiveness of design, use of colour, and attention to detail in each piece of glass distinguishes it as perhaps the finest stained glass window in the county. The window is illustrated in a full-page illustration in Stained Glass from Welsh Churches, and makes a clear contrast with another First World War memorial, dedicated not to the memory of a single soldier, but to all the men of the parish who died in the war, by the firm of C.E. Kempe. As in the case of many windows illustrated in the book, there is no space for a more detailed analysis of the complex imagery of the Parsons window, and the illustration of any details. This has now been remedied with a booklet illustrating and describing all of the stained glass at the church, which was launched on Sunday (28 September) during the morning service. The book was funded by the Friends of St Mary’s and sales will contribute towards the upkeep of this important historic church. As well as these war memorial windows, there are nineteenth-century windows by William Wailes and Clayton & Bell, two smaller windows by Karl Parsons and C.E. Kempe & Co. and a window of the 1950s by John Hardman Studios. While researching for the booklet I was pleased to find correspondence relating to the first window commissioned from Karl Parsons (in 1908) at Pembrokeshire Archives, which provides an insight into the appointment of the artist and his status as a pupil of Christopher Whall. Unfortunately I was unable to find the name of the designer or the studio responsible for the little window of Faith, Hope and Charity in the south wall, but papers in the National Library of Wales did allude to some controversy over its use of imagery. 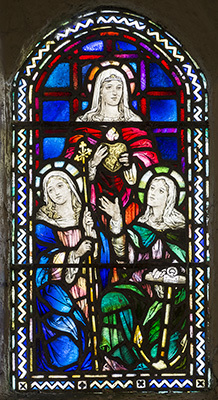 The windows at the church can all be viewed on the online Stained Glass in Wales Catalogue, and I would be grateful for any suggestions of the maker of the Faith, Hope and Charity window. Perhaps it was made by another artist based at the Glass House, Fulham, where Karl Parsons had a studio, or perhaps by one of the students trained at the Birmingham School of Art. The website accepts comments on sites, artists/studios and individual windows. Copies of the booklet (priced £2.50) can be obtained from the church (or I can forward requests for the booklet if you contact me via my website).